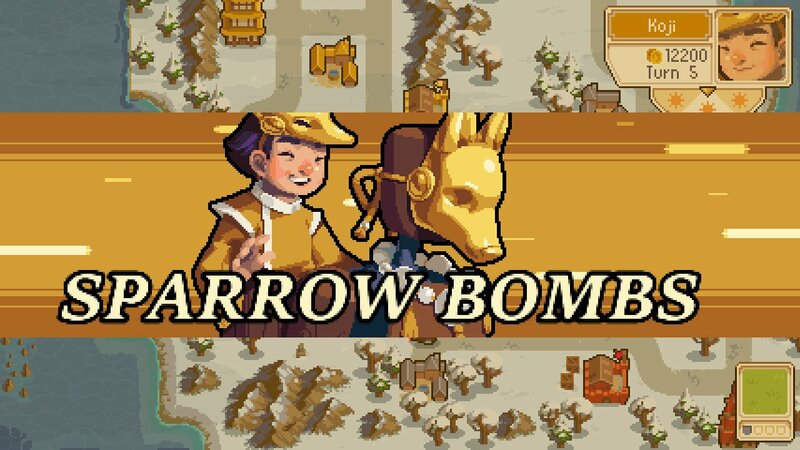 Wargroove is more than the advance wars we never got, carving its own excellent niche in the turn-based tactics corner. 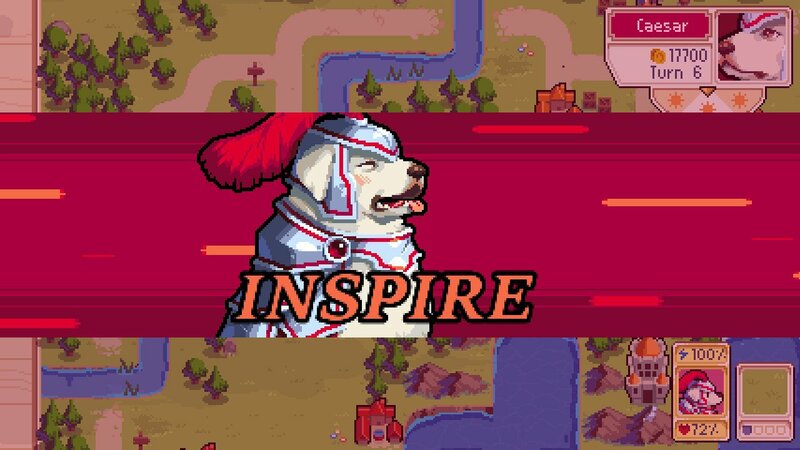 Much like Nintendo’s inspirational series, Wargroove offers a range of commanders to unlock and play as, each with their own Groove or special power. These commander abilities can turn the tide of a battle, so it’s of vital importance that you understand how each one of them works. 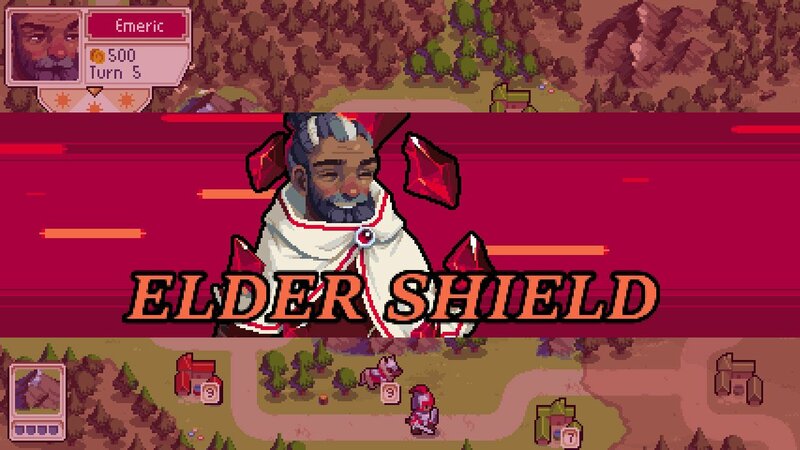 In this guide we’ll give you the lowdown on each faction’s commanders and how their Groove powers work in Wargroove. 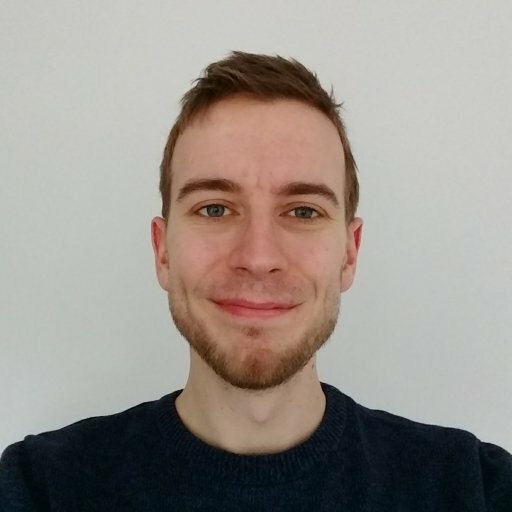 Grooves are charged naturally over the course of a game (10% a turn for Fast Grooves), but you can increase the charge rate by fighting with your commander. Attacking and defending both boost your Groove meter - visible by the lightning bolt in the bottom left corner of the screen when the commander is selected - but you can drastically increase the charge rate by having your commander land finishing blows. Where possible, it’s usually best to have your commander kill a unit to charge faster, but don’t do this at the expense of your other troops unless necessary. There are three Commanders in each of Wargroove’s four factions (Cherrystone, Felheim, Floran, Heavensong), and while there’s no unit difference or power theme between each faction, we’ve split the Commanders by faction below to make finding them easier. Lead Protagonist of Wargroove’s Story, Mercia is the young ruler of Cherrystone, and an eager leader on the battlefield. Her Groove, Healing Aura, restores 50% health to all friendly units in a range of three. The key to this ability is that it adds 50% of the unit’s maximum health, and not its current. Rather than rely on the large numbers to judge a unit's health, we recommend checking the percentages before using Mercia's ability. To see a unit’s exact health, select it and look at the number by the heart in the bottom left corner. Royal advisor to Cherrystone, Emeric’s Groove is called Elder Shield and places a defensive crystal adjacent to Emeric’s position. The Crystal projects a defensive matrix over a range of 3 around it. The crystal increases the terrain defensive bonus by three points (up to the maximum of four) to any allied units. This means a unit standing in a road (0 Defense) will receive the defensive bonus as if they were in a Forest (3 Defense). Extra protection from the crystal is shown in blue. The crystal spawns on 100% health, losing 20% at the start of your subsequent turns until it disappears — that’s five turns including the one you placed it in. Enemy units can attack the crystal to lower its health and even destroy it. Elder Shield is best used to deny an area to an opponent, as they won’t want to attack while it’s up, or to be placed right before you begin an attack. Placing the crystal right just before you attack can give your units a huge advantage, significantly reducing the damage taken by counterattacks. 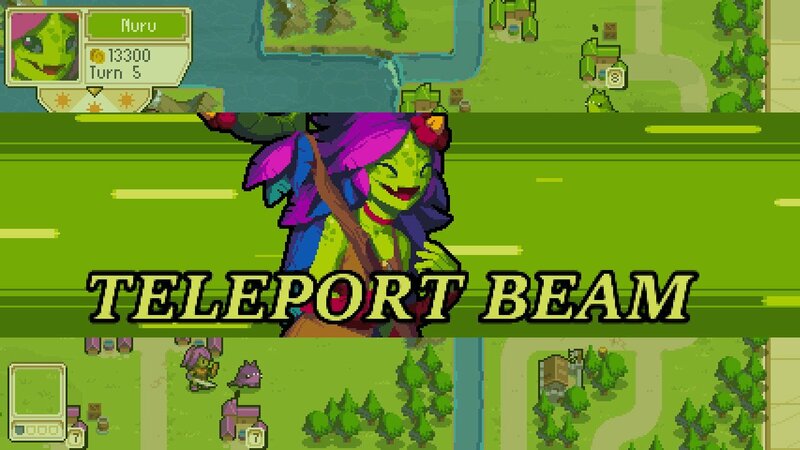 Companion of Mercia and Wargroove’s undisputed Best Boy, Caesar’s Groove, Inspire, refreshes adjacent units, letting them act for a second time in a single turn. Inspire only affects units that have already acted this turn (appearing dark on the map) so you need to make sure you used Caesar after the units you want to affect. This means you should try to arrange units you want to activate again in to a plus formation, with a space at the middle for Caesar. Considering how vital your Commander’s combat abilities are in the early stages of a game, it’s best to save Caesar’s Groove for more powerful units, but it can also be used to help slow units traverse the map. 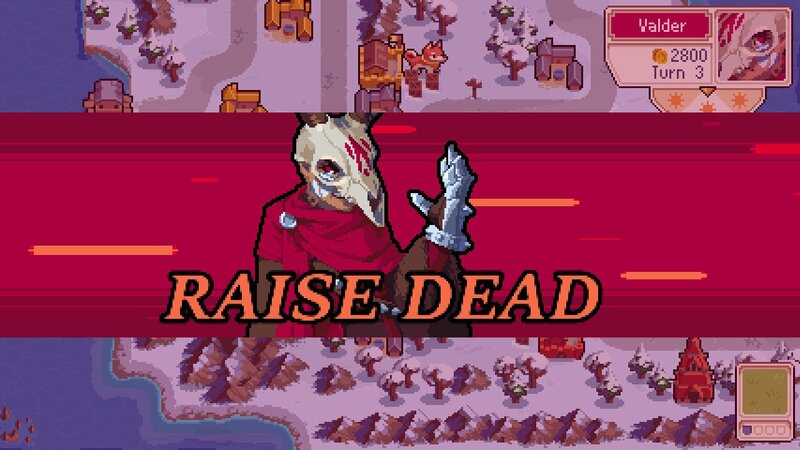 Archvillain of Wargroove, Valder’s Groove is a surprisingly straightforward and hands off affair. Valder can use Raise Dead to summon a Dreadsword (Felheim’s Soldier) on an adjacent space which becomes active immediately. The Dreadsword is one of the weakest units in the game, but Valder’s ability to spawn it for free and make it active on the same turn can catch you dangerously off-guard. Raise Dead is one of the most powerful early game abilities as it charges extremely quickly and gives him a numerical advantage in early fights. Additionally it can be used to capture more buildings or save money on purchases, letting him save for more expensive units. The indignant Ragna is one of Valder’s main servants, and likes nothing more than getting up close and personal with the enemy. Ragna’s Shield Jump Groove can be used to traverse a distance of up to five spaces, dealing damage to all enemies within range 3 of the landing space. Ragna deals 65% of her full health damage to units in the blast zone, making this a powerful way to kick off an attack or hunt down a fleeing, low health commander. 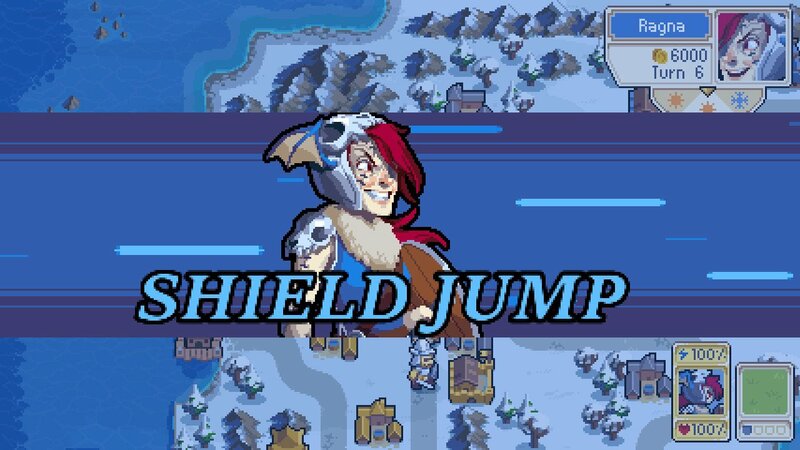 Shield Jump is also a great way to jump behind enemy lines and wipe out an opponent’s pesky ranged units, all of which are weak to commander attacks. If Ragna finds herself in trouble, she can also use Shield Jump to launch herself to safety, though this does sacrifice damage output. High Vampire Sigrid is rather aloof as commanders go, but that’s probably thanks to her being one of the toughest units to kill on the field. 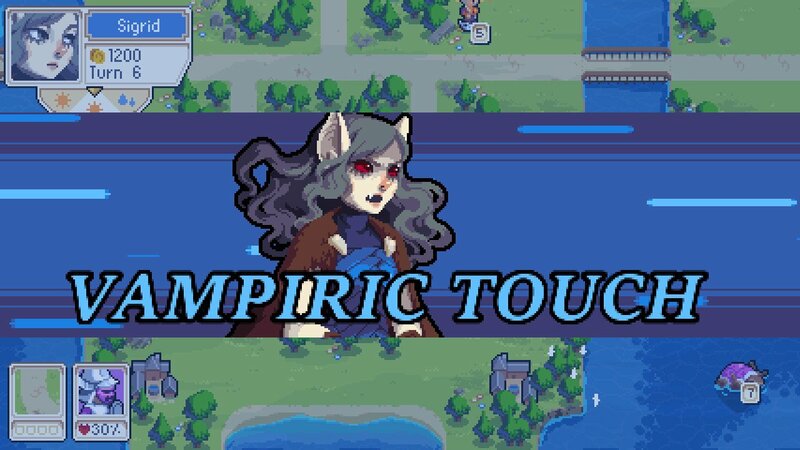 Her Groove, Vampiric Touch, drains the full health of a unit adjacent to her, killing it instantly. More than that, the stolen health is then added to Sigrid’s own (to the maximum of 10). Vampiric Touch works on any unit, making it one of the most powerful attacks available in the game. Attacking Sigrid with tough or expensive units is therefore a huge risk while her Groove is charged. Leader of the Faron, Greenfinger’s Wild Growth Groove can summon five vines within a range of five around him, blocking the path of enemy units. Much like Emeric’s crystal, the vines start at 100% health and lose 20% at the start of Greenfinger’s turns. They can also be attacked and destroyed by enemies. The crucial point to note about Greenfinger’s Groove is that allied units can pass through the vines, allowing you to hide behind them and launch attacks outward. This is useful for forcing your opponent to move to a weaker position before you strike. 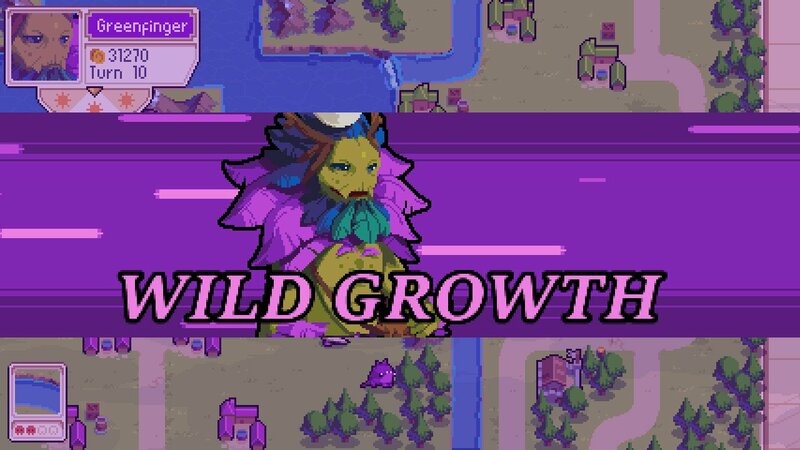 Nuru is a young Floran commander with impressive magical ability on her side. Nuru’s Teleport Beam Groove can pay to summon a land unit to any empty adjacent space. The cost of the unit is the same as if you purchased it from the Barracks, but the unit will become active immediately, meaning it can attack on the same turn it is summoned. Along with reducing the time it takes to get units to the front lines, Teleport Beam also increases your potential unit production, letting your churn out more units than any other commander. In the late game this can prove devastating. As well as summoning Giants to the front, Nuru can use Teleport Beam to place a Trebuchet or Ballista in the perfect position for a critical hit, which can be tricky to set up otherwise. Sedge, the Faron assassin commander has an unquenchable thirst for blood, resulting in his expensive but deadly Sadistic Rush Groove. Sadistic Rush allows Sedge to attack an enemy for 35% damage (regardless of enemy type or Sedge’s health). If the enemy dies, the Groove and Sedge’s actions do not end. Sadistic Rush, while slow to charge, is incredibly powerful in later stages of the game, thanks to the ability for sedge to kill multiple enemies in a single turn, chaining together attacks on low health targets. Be careful with this move however, as it’s very easy to overcommit and send Sedge further forward than is safe, leaving him in danger once the Groove ends. Ruler of the Heavensong, Empress Tenri is a wise ruler and strategic genius with mastery over the air. Tenri’s Groove is Rising Wind, which allows her to move any unit within range 6 (allied and enemy) except for Commanders, to anywhere else within that range. 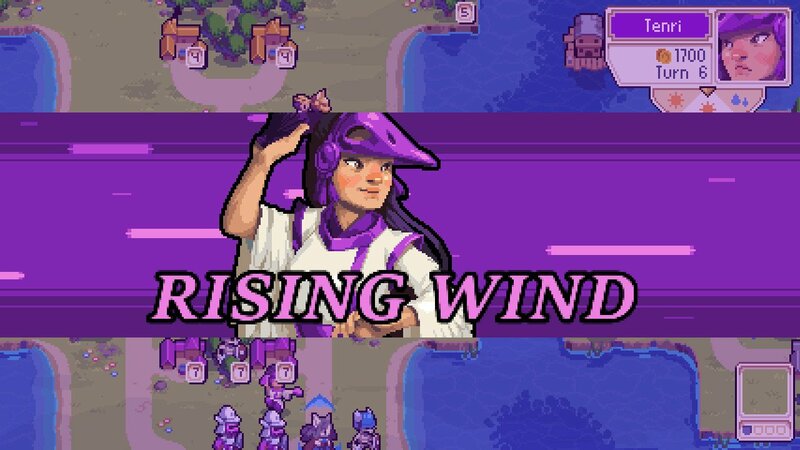 While it doesn’t deal direct damage, Rising Wind is extremely versatile and isn’t limited to just moving enemies far from battle or into tricky positions. Rising Wind can also be used to advance a friendly unit that hasn’t moved yet forward into an aggressive position, or past blocking terrain to mount an unexpected assault. Ryota is the warrior of the Heavensong, dealing damage with his blade-like metal legs. Ryota’s Groove, Blade Rush, lets him dash through lines of enemies, dealing 45% of his max health damage. 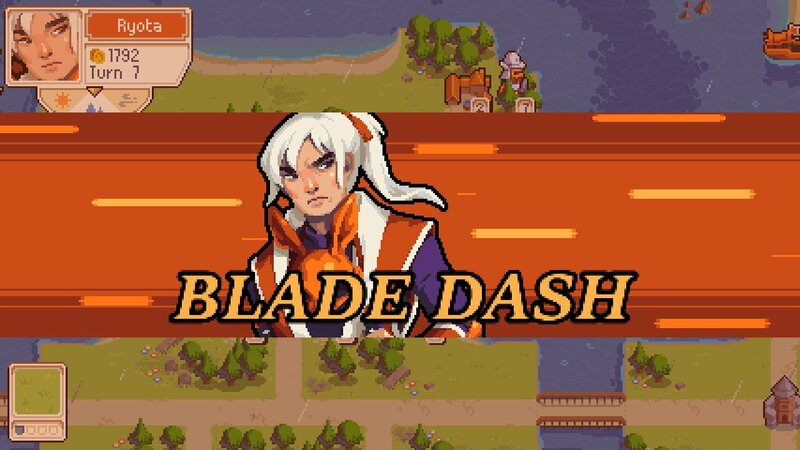 Blade Dash is a devastating attack thanks to its ability to chain repeatedly so long as there are adjacent enemies to pass through. Watch your opponent’s battle lines for a series of gaps, then unleash Blade Dash to swipe through multiple lines for maximum effect. Koji is Tenri’s son, and the weapons engineer for the Heavensong, riding into battle on the back of his custom built Fox robot, Tenko. Koji’s Groove is Sparrow Bombs, which spawns two flying explosives in adjacent spaces of his choice. The bombs become active immediately, and can be detonated at the end of any movement to deal 50% of Koji’s maximum health damage to all adjacent units. Koji’s Sparrow Bombs charge slowly, but have an enormous impact when unleashed. As well as damaging enemy units, Sparrow bombs can be used to deal a good 40% damage to an enemy commander in a surprise hit. It’s best to summon and use them in the same turn to avoid the enemy having a chance to shoot them down. 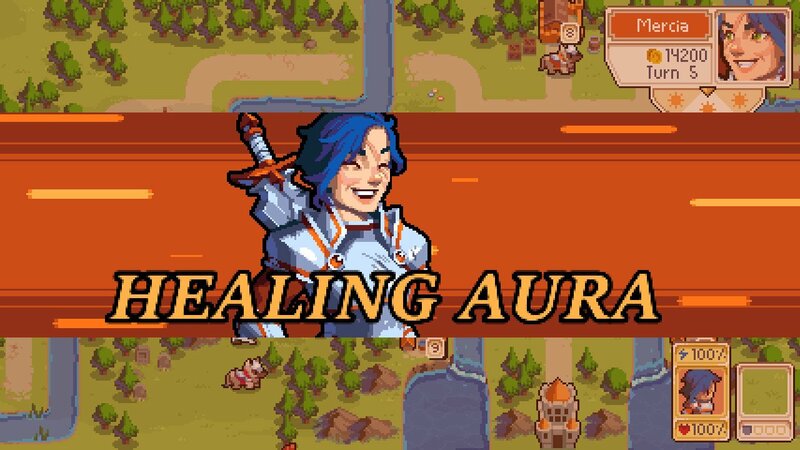 That's the full rundown of Wargroove's Commanders and the Grooves, but we've also got a guide to teach you every unit's strength and weakness matchup as well as their critical hit condition in Wargroove!